It will begin with the sound of Thunder pounding on a drum … a primal calling from GCU’s mascot to the masses that are the students of GCU. Next come the music and lyrics of “Make it Rain” (the sanitized version) by Fat Joe. The message: The Monsoon is coming! With that, students will begin descending into their seats at GCU Arena, ready to “wreak havoc and mayhem” during basketball games from the newly named Monsoon student section. Such theatrics are just one part of what GCU is doing to energize its students and add to the electricity at home basketball games. Students will begin gathering 30-45 minutes prior to tipoff in a staging area upstairs near the concession area. 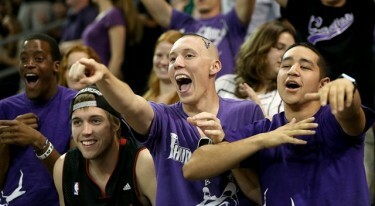 There, they can get their faces painted, add GCU tattoos and play games. “We’ll also inform them a little bit about what is required, how to act at a game, what you can say, what you can’t say, what you can do and what you can’t do,” Griffin said. Those lessons will actually start even before the first home game on Nov. 5. Next weekend, a group of 400 students have signed up for a bus trip that will take them to Anaheim, Calif., for the three-day Disney Classic tournament involving GCU’s men’s and women’s teams. The student section, shown at a game last year against ASU, is raising its game to a whole new level for this season. En route to the Disney Classic, Griffin said “training camps” will be held on the buses, giving students a history lesson on GCU basketball and going over the team’s current roster of players. “We’re going to take 400 students up there and blow the lid off the place,” he said. Griffin, a former volleyball player at GCU, also has a student “research department” at his disposal. Their mission: to dig up dirt on opponents that the Monsoon section can use against them. “When I played volleyball here, we played at all the big schools. They know how to heckle at those schools,” Griffin said. “We’ll have people who will find out the dirt on the other team … their parents’ names, where they’re from, their Facebook page. If all of that isn’t enough to get the students revved up, there’s also this: About $20,000 in merchandise will be given to members of the Monsoon in a drawing at the end of the season. Two plasma TVs, two MacBook Pros, four Xbox 360s, Nintendo Wii games, Dr. Dre Beats Headphones and $100 gift cards are just some of the giveaways in the works. “The students are pretty excited about it,” Griffin said. “When they hear about the dance parties, the bonfires, the pregame and the postgame stuff we’re doing, they’re pretty excited.